Yes, I feel very much like a John Farnham comeback tour after he said he was retiring from show business about six thousand times. After a month off, I miss Motivating Giraffe (and all of the beautiful online friends I have made through this adventure!) too much to stay away forever. I’m glad I took a break, because I definitely needed it and it gave me some time to think about things – I don’t think MG will continue being a daily comic because the pressure really started to get to me! But I do want to bring these guys back once or twice a week, for you and for me. This has taught me something pretty important. You have to take care of yourself, or you won’t be any good for anyone else. It’s easy to forget that you’re important, too. ← Motivating Giraffe photo book update! I’m glad you’re back at whatever pace suits you!! Hooray! (How does one say that in Giraffe?) :) I hope you enjoyed your brief respite. I gave one of my dear friends one of the prints I ordered, and he would like to know what tools you use. I promised to ask you for him. Welcome back. I’m so glad that MG convinced you to come back. Best news!!! Set a schedule on the side of fun… Looking forward to your posts. Quit if you want to quit… come back if you want to come back. There should be no pressure to do either from anyone, including yourself! When you find yourself doing it only because you “have to” do it… the art suffers… when you deprive yourself of doing it just because you “quit” you suffer too. hahahaha john Farnham your hilarious , cant wait to see more!! I, for one, am glad Motivating Giraffe is back! I discovered MG just before you retired. I was sad MG was going away. I’m glad to see your giraffe back. I think pushing a schedule in a creative field can kill the creative mojo required. Breaks are an investment, therefore, in your art. Enjoying what you do sometimes means not doing it. 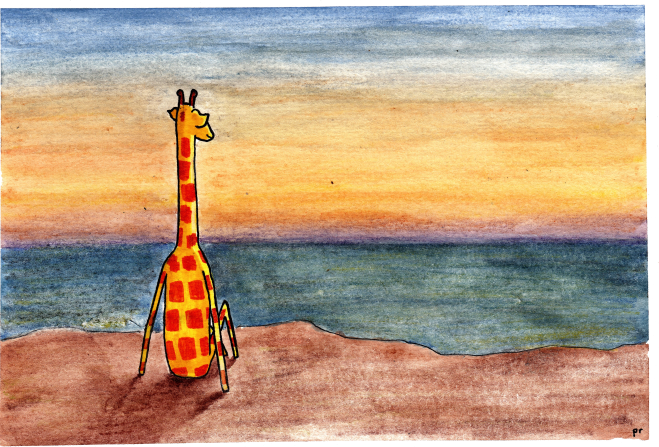 Pensive Giraffe can be inspiring, too.